This is a long overdue post, explaining how Discoveroom connects to various channels and the things one needs to pay attention to. So let’s better take this from the beginning. Quite simply, a channel is where reservations are coming from. A travel agent is a channel, our telephone is a channel, a site like booking.com is a channel, the hotel’s own website is a channel. For convenience, we make a distinction between online channels and offline channels. The online channels are the ones where people make a booking, using the internet and the web. They are third party websites or mobile apps. Their common denominator is that they are web/app based. So, the online channels are mainly the global OTA’s (the likes of Booking.com, Expedia, AirBnb etc) and regional or local ones. The offline channels are all the ones that are not based on the web or a mobile app. The telephone and the travel agents are the most common. It is common that a property advertises its rooms and availability on more than one web sites. This fact creates a problem: when a booking takes place in one site, all the others have to be updated about the decrease of the availability of this particular room. Not being updated timely, makes the risk of a double booking all too real. Availability updating can be performed manually. But a human has to sleep or take a break. So the time that it takes between a booking and a manual update ranges widely between a few minutes and many hours. The wider this interval, the bigger the risk of a double booking. The problem gets trickier as the availability might be reduced because of bookings that took place offline. So the poor lodge owner has to be constantly vigilant and rush to make the updates upon each new booking. For a big property this is nearly impossible. Wouldn’t it be nice to automate this updating and minimize the risk of double bookings? Enter the Channel Manager. The Channel Managers are programs and services that automatically update channel availability. They interconnect the various channels, plus the applications the lodge owners uses to keep track of the offline bookings (like our PMS). Since there is a constant link between channels and the lodge system, it is very easy to also transfer the actual reservations from one system to the other. In short, channel managers interconnect channels and hotel systems, retrieve bookings from the channels and transfer them to the hotel and update channel availability automatically, whenever a new booking takes place, regardless where it takes place. Discoveroom, at its core, is a PMS (a= Property Management System). It does not connect to channels directly (this is a choice, not a limitation. It could connect directly, but we have decided not to) therefore it does not play the role of a channel manager. Instead, it connects to other third party channel managers and through them, connects to the various channels. Why not connect directly? It is a matter of focus and resources. There are dozens of different channels out there and building connections with them requires money, time and expertise. We have decided that this is not the area we want to focus, since there are already many channel managers out there, performing a decent job. We have, so far, connected with two channel managers: Octorate and WebHotelier/Primal Res. The choice is driven by geographical considerations. The bulk of our clients reside in the areas where these two channel managers are originating and operating. Geographical expansion will certainly lead us to add more channel partners. In both cases the creation of the property in the Channel Manager’s system is performed by us or the Channel Managers. When this is done, the menu option “Channel Manager” within our web app, allows you to create a new room type mapping between the two systems. The room type mapping is essential for the correct reservation retrieval and updating. Discoveroom allows one-to-many relations, where one room type from Discoveroom can be mapped to more than one room types on the channel manager side, but not vice versa. Is there a difference between these two Channel Managers? Yes, there is. While both perform the same task of retrieving bookings and updating availability, there are differences on how they function, how they are priced, which channels they support, etc. The choice is up to the client. We want to offer what best suits him. More specifically, the WebHotelier/Primal Res solution has a very deep integration of the booking engine (WebHotelier) and the channel manager (Primal Res) and that’s why they are offered together. For both channel managers, the pricing for the channels is entered on their side, while the pricing for the PMS is entered in Discoveroom. There are plans to integrate these two functions but for the moment they are distinct. 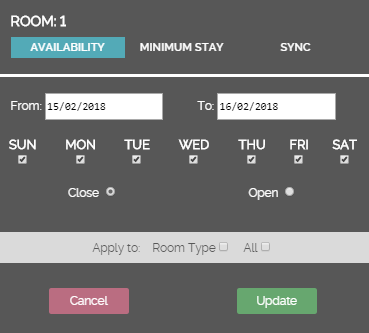 Discoveroom is built around the concept of always managing the true availability, since it allows the users to enter reservations into the rooms directly, and not in room types. Also, the reservations imported from the channels are automatically assigned to rooms. The reasons for this are multiple: we want to reduce hotel manager’s load of work, make it easier to understand what is there to sell online, reduce the double booking risks, etc. For this reason, we have built tools within discoveroom that close the availability to the channels and change the minimum stay. We follow the principle that the PMS should be point of truth about availability. This means the PMS will drive the channel managers and not vice versa. And therefore, availability opening/closing that is not related to specific reservations, should be handled by the PMS. However, there are cases where experienced hotel managers, for reasons of attracting more bookings, want to advertise room availability higher than the real one, knowing that there is an inherent double booking risk. These cases availability should be set directly on the channel managers and not from Discoveroom. But there is a problem here: Discoveroom always reverts to the true availability, so if a room change takes place, it will send back the true availability to the channel managers. This does not pose a problem of double booking. On the contrary. But it creates a workload for the hotel managers that will see the artificially increased availabilities reverted to the real ones and will have to adjust them again. Another common problem with availability is when a booking has to be split between different rooms. Let’s examine the root cause of this case. OTA’s display room types. They know nothing about the specific rooms of a property, just the number of available rooms for each room type on each date . Room Type X comprises of two rooms (A and B), so the total availability when both rooms are free, is 2. Let’s say that between the 1st and the 3rd of the month, room A is booked, while between the 4th and the 6th room B is occupied. What availability will a channel display for the dates between 1 and 6? The answer is, of course, 1. Move the reservation for room B to room A. Then the channel reservation can be retrieved in room B. Move the reservation for room A to room B. Then the channel reservation can be retrieved in room A. Enter the channel reservation manually, splitting it between room A and room B. In practice, all these solutions and more (like upgrading the client to another room type) will be required. There is nothing wrong here. It is the nature of this business that makes such problems arise. The way meals (breakfast, mainly) are bought with a reservation from an online channel varies. They can be included in the reservation price, they can be bought separately but along with the reservation or they can be bought by the client after the check-in, during his stay. For reservations coming from channels, this piece of information resides in the reservation notes. Information about Non Refundable Payments are also added in the reservation notes. Plus, other information, like cancellation terms, whenever they are relayed by the channel managers. All the above should be considered as the basics of channel management. There are many details and many subtle differences between channels and systems. But these are the subject of future posts.